We are officially in VIETNAM! Woohoo!! If you missed my last post on the how, what, when, where, why — check it out here. One thing I didn’t cover was the content for my food posts: I’ll likely still be talking about day-to-day stuff, like I did in Bozeman, but now my daily life is traveling! I’ll save the nitty-gritty travel details for travel-specific posts. So far we’ve been exploring Hanoi, mostly by foot, and adjusting to our new “lifestyle” as nomads. Of course we’re making a point of eating delicious, local, Vietnamese food. It’s incredibly easy to find a little hole-in-the-wall joint, bursting with locals. We just sit down and a bowl of steamy noodles (or whatever the specialty of that particular spot is) appears in front of us! We look entirely silly sitting on tiny little baby stools, but we make it work! My favorite so far was our lunch yesterday — bun bo nam bo: a big pile of rice noodles with beef, herbs, and a little bit of broth (not enough to make it soup, like pho!). 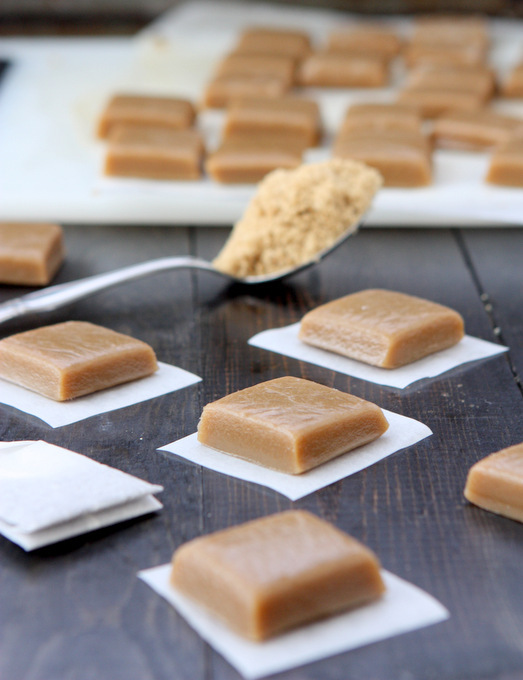 I thought I’d share these caramels today because it seems fitting — we’re drinking a lot of tea! I’m not sure exactly what type of tea we’re being served most of the time, but it smells and tastes exactly like the temples smell. If you’ve ever been to a temple, you know what I’m talking about! It’s unmistakable! It’s delicious! 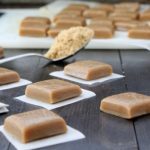 I made these caramels before we left Bozeman in an attempt to use up some of our remaining food, including tea and brown sugar! 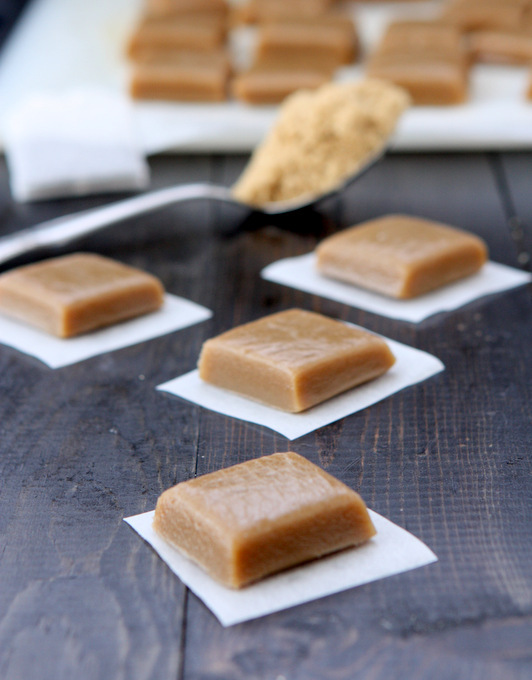 I love jasmine tea, and thought it would be perfect in a soft pillow of caramel. I was right! I was really nervous that the flavor of the tea wouldn’t actually come through, but was pleasantly surprised to find a strong, but not overpowering, jasmine undertone to the caramels. 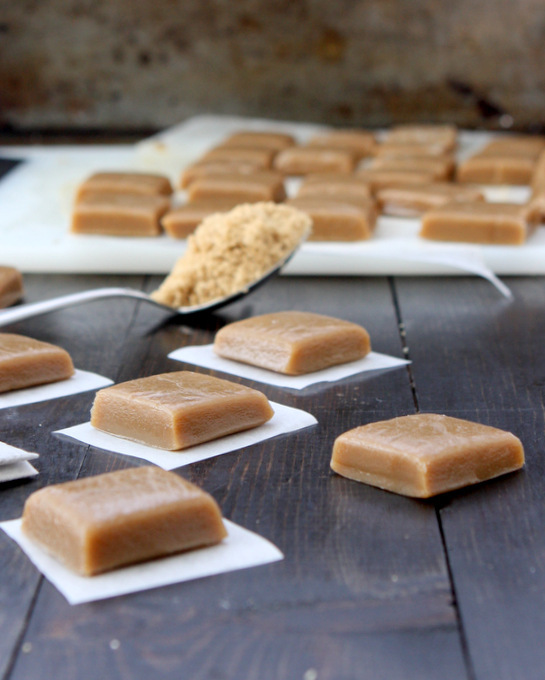 I’m particularly fond of brown sugar caramels because my mom used to make them all the time, and they’re so soft and delicious! I adapted this recipe from her “Christmas Cookbook” which includes a variety of recipes she makes during the holidays. They’re some of my favorites! For the jasmine in this recipe, I suggest seeking out a high quality jasmine tea. It will make a big difference in your final product! If you have loose tea, use that, but if you only have tea bags you can cut them open (you’ll need a few of them) and then have loose tea. Take care not to over-brew the tea, either! 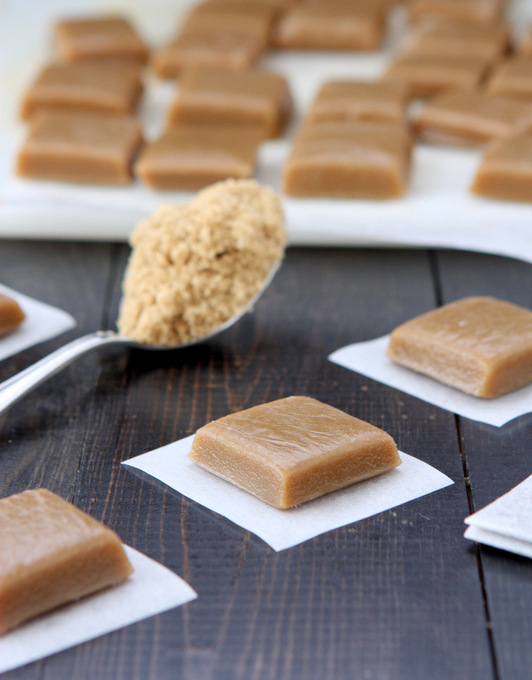 You don’t want bitter caramels! Butter an 8×8 inch pan, line with buttered parchment paper, and set aside. Heat the half & half until near boiling, then submerge the tea and let steep for 2-3 minutes. Remove the tea, and set the half & half aside. Combine the butter and brown sugar in a large, heavy saucepan. Melt while whisking. Once melted, add the corn syrup, salt, and jasmine-infused half & half. Whisk to combine, then bring to a simmer (and stop whisking) and cook until a candy thermometer reads 244 F.
Remove from heat, stir in the vanilla extract, and pour into the prepared pan. 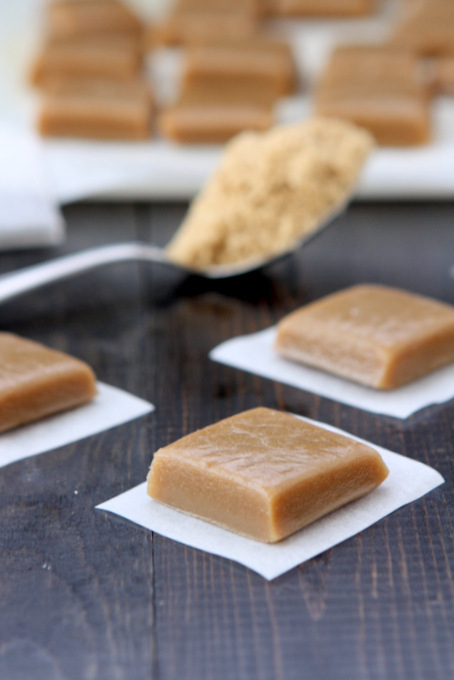 Once cooled, cut into small squares and wrap in wax paper. Previous Post: « Upcoming Changes to TKP: Our Year Abroad! I seriously want to eat every one of those. Love that you put jasmine tea in there! On another note, nothing like authentic Vietnamese food huh? It’s the best! Naomi is vietnamese and she takes me to Little Saigon here in SoCal all the time and we go crazy over the food. 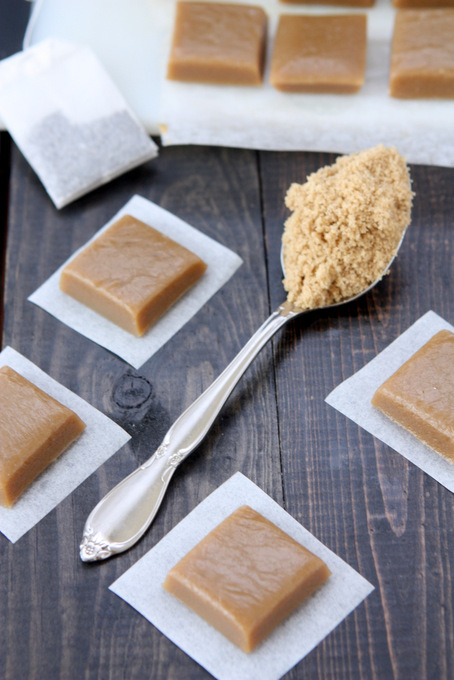 Jasmine Tea + caramel seems like such a great combination that I would have never thought of. These look so luscious and absolutely divine! Thanks, Graham! I really enjoyed the combo — it was a new one for me, too! Instead of using Half & half, would it be possible to use the tick part of a tin of coconut cream? Hi Roxanna — I would use the whole can!! Coconut cream is a great substitute.